Yea, it’s true. I think insulation is awesome. It keeps our indoor environment comfortable, and it does this in so many ways other than just keeping the warmth inside. It also provides sound deadening, prevents air infiltration, and deals with condensation. The part I nerd-out on is how insulation can most effectively keep your home cool in the summer and warm in the winter. Insulation science has changed a lot over the years, so here’s your crash course on it. We are all mostly familiar with the pink, fluffy, itchy stuff that you see rolled out in attics. That is called batting, or batt insulation. It is the default, cheapest insulation, and it provides an R-value of about 3 per inch. That means a 1” thick layer of batt insulation would “resist” (that’s the “R” in R-value) the flow of heat through itself by a unit of 3 BTU’s per hour. Don’t think too much about that…just know that the bigger the R-value, the better. Batts have a relatively low R-value when compared to other types of insulation. Also, batts are squishy, so they tend to slump down within a wall due to gravity over time, and this leaves parts of the top of a wall un-insulated. The top of a wall is the worst place not to have insulation since warm air rises. 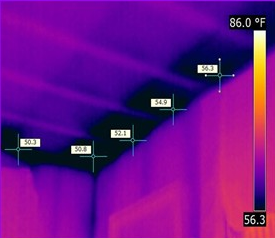 If you look at a thermal image of a wall in an old house (see below), you can usually see the blue areas (cold temps) are concentrated at the top of a wall where the insulation has fallen over time. This is also because fluffy batts get wet through condensation or leaks, and that extra weight pulls the batts down within the wall. Batts are like a sponge, and they don’t dry out easily. Because of this and their low R-value, I prefer other forms of insulation. 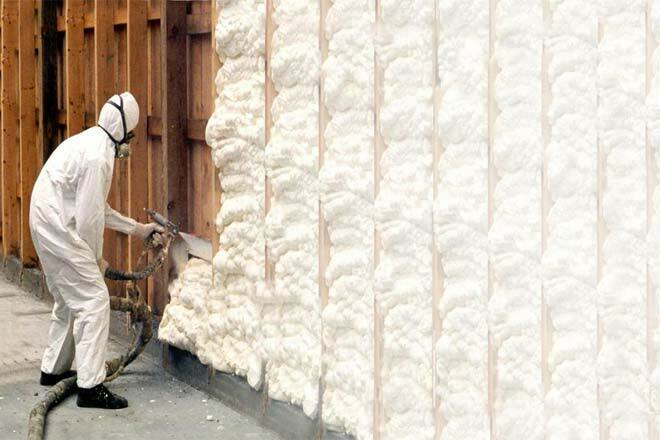 There are a bunch of other types of insulation that are fluffy like batting and have a similar R-value per inch. These include loose cellulose, roxul, wool, cotton, and denim. Some people believe they are being “green” by using recycled denim for their insulation, but in reality, the R-value is quite low, so all these insulation types don’t do the best job of keeping the heat in your home during the winter. The higher performing insulation types are rigid - not fluffy (like a cooler...you know coolers don’t have a fluffy lining. You better believe that $300 Yeti cooler has rigid insulation). The rigid types can either be sprayed into place, or they can be purchased in panels. The rigid insulation types have higher R-values per inch and include polyicynene (R-4), expanded polystyrene known as EPS (R-4.5), extruded polystyrene known as XPS (R-5), phenolic (R-8), polyurethane (R-8), and polyisocyanurate known as polyiso (R-8). The R-values listed here can vary over the life of the product as they deteriorate over time, but they are still superior to the R-value of the fluffy insulation types. Not only do the rigid insulation types resist more heat, but they also create a tighter “envelope” around the building since the seams between rigid panels can be covered with tape and caulked. This prevents the passage of air through any cracks or weak spots known as air infiltration. Imagine wearing a puffy coat, but not zipping it up. The cold winter air will make you cold, and the coat doesn’t do much good. If you zip it up, your body heat is trapped inside the coat. Rigid insulation gives us this capability of “zipping” our home shut tight, and trapping the heat inside. Fluffy insulation is a bit more loose fitting, and it does not have the capability of continuously wrapping the house. The fluffy stuff just sits in between the studs, while rigid boards can also be used to cover the studs continuously on the interior and/or the exterior sides of the wall. See the image below, and notice how the polyiso board with its reflective coating reflects the heat into the interior space, and all of it’s seams are covered with a reflective tape to prevent air from flowing in between the panels. The last point to address with rigid insulation is the difference between open-cell and closed-cell. They can both be spray-applied or purchased in panels. The open-cell types are a pliable type of foam and have a lower R-value and are less expensive. The closed-cell types are a more solid type of foam and have a higher R-value and are more expensive. The main selling point for closed-cell insulation is that it does not allow moisture to permeate through it since it is so dense. This includes liquid moisture and, more importantly, water vapor (which is water in gas form like when we exhale, take a steamy shower, or have equipment that puts off vapors). Preventing water vapor from passing through the insulation is very important, because we MUST allow any moisture to dry out or mold will develop. We go through a lot of effort to keep our attics and other void spaces ventilated by allowing air to flow through and evaporate or carry out any moisture in the air to prevent mold from developing. The closed-cell insulation types are so dense that they do not require us to ventilate our roofs or other spaces (when installed properly) since they simply do not allow moisture to pass through. This is a huge benefit along with its superior R-value, sound deadening, and prevention of air infiltration by creating a continuous air barrier. Feel free to ask about different approaches to keeping your indoor environment comfortable through the use of insulation. The type of insulation to use is just part of the equation. HOW to use the insulation is the fun part and varies in each application. We can help you design the perfect construction details to keep your building performing at its best.